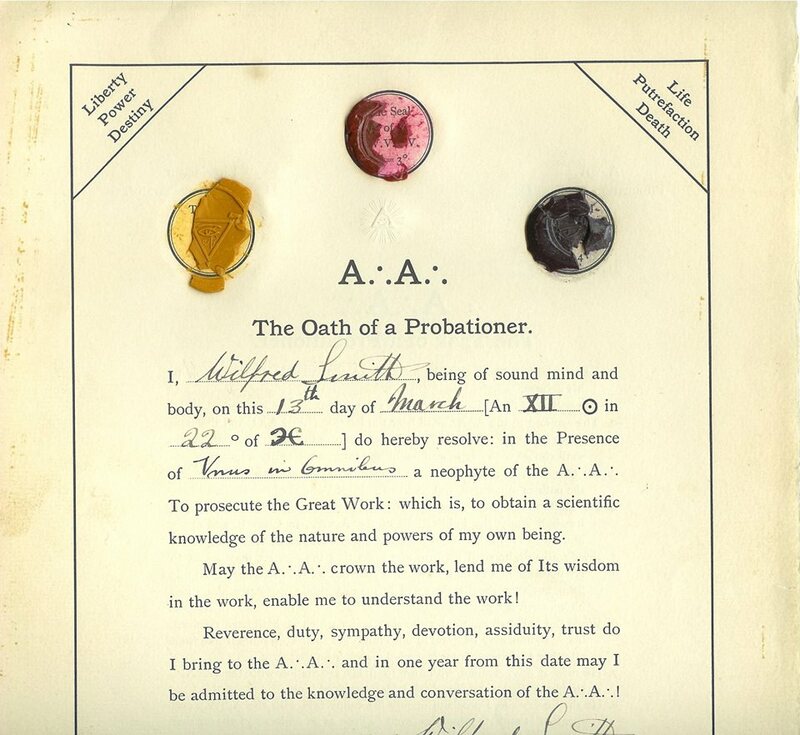 Rarely seen outside of the Order –are the original seals of its Officers as per Crowley design. 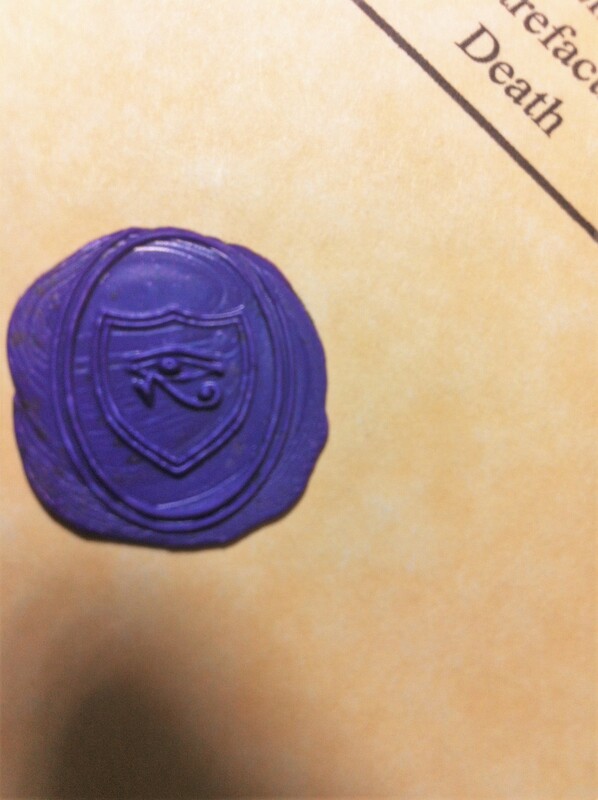 Being that these seals are wax, they are fragile and very few have survived undamaged into modern times. 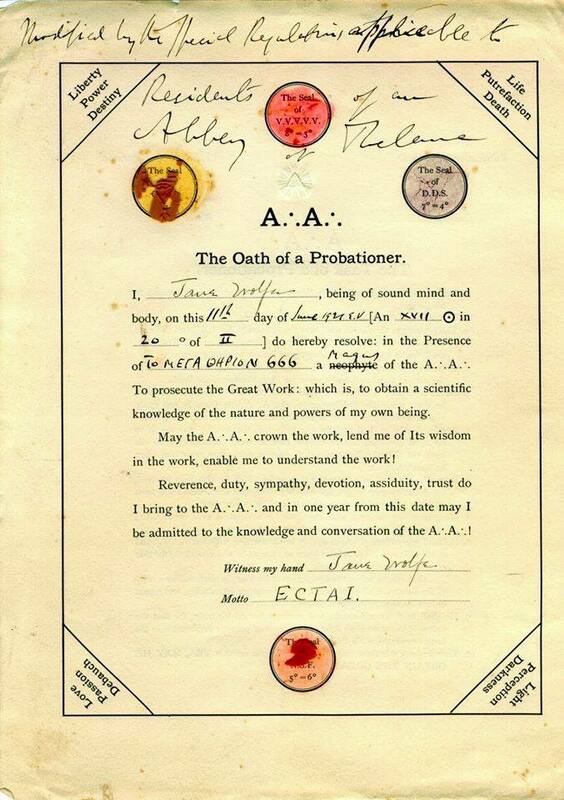 For example, here are images of both Jane Wolfe and Wilford T. Smith’s Probationer Oaths. 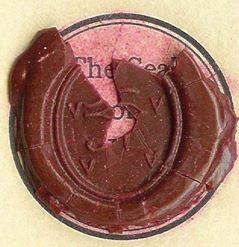 The condition of these seals with little to no remnants is typical of what is most often found. 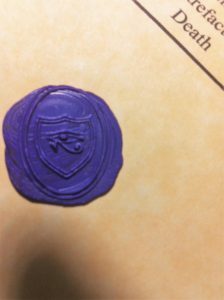 Below are a few images of the rare original seals still mostly intact. 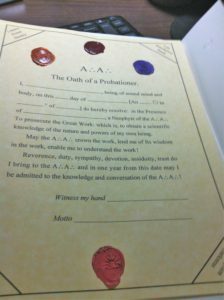 For those of you who don’t know the Oath of the Probationer came affixed with four seals each corresponding to an Officer. These are: The Cancellarius (5=6), the Imperator (6=5), the Praemonstrator (7=4) and the seal of V.V.V.V.V. (8=3). 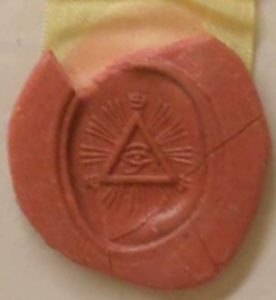 Each seal is impressed upon the colored wax which corresponds to the Officers Grade and position on the Tree of life (as per the King scale listed in 777). That being – Pink rose for 5=6, Orange for 6=5, Deep violet for 7=4 and Crimson red for 8=3 and corresponding with Tiphareth, Geburah, Chesed and Binah; or Sun, Mars, Jupiter and Saturn. It is interesting to note that while the seals of the officers are given in the King scale the original designs for the officer’s robes reflect that of the Queen scale. (The Robe being that which is said to conceal and protect and varied according to Grade and Nature). The King scale is said to represent the root of color and the Archetypal World while the Queen scale is said to be the first positive appearance of color and represents the Creative World – The former is believed to be transparent while the latter is reflective. 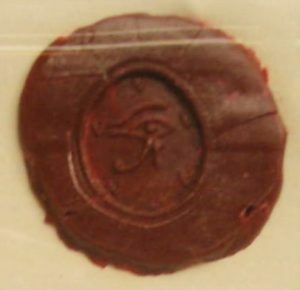 All four seals feature the eye of Wedjat, also known as the Eye of Horus or Ra. 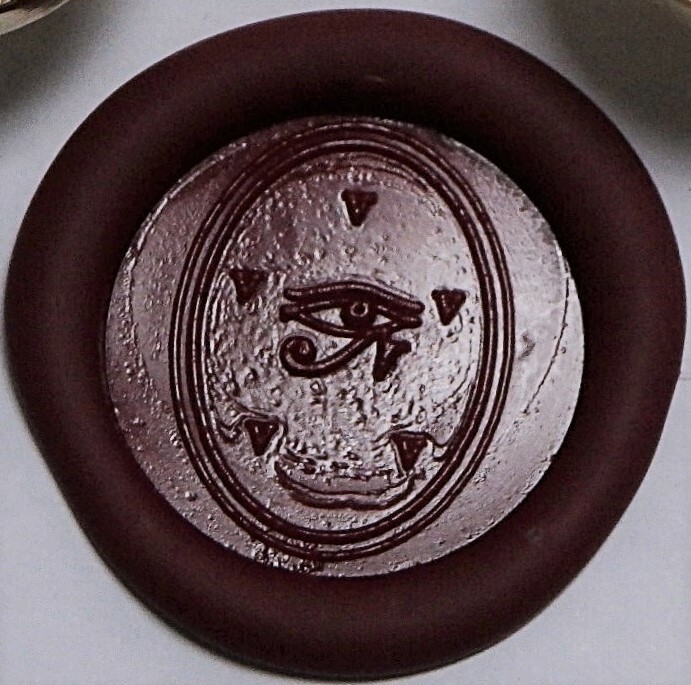 Some traditions have it representing the Sun when the right eye and the Moon when the left; in either case it is considered to have restorative and revitalizing qualities and appears as the classic Egyptian “Eye” we are all familiar with. 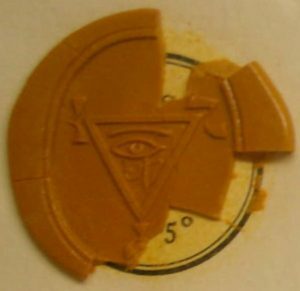 The seal of the Cancellarius is the classic Eye in the triangle imagery and consists of twelve sets of three rays. The Imperator seal is an inverted triangle with Eye and no rays. That of the Praemonstrator is a basic shield design with an Eye at the center and finally, the seal of a Magister Templi is of an Eye surrounded by five V’s forming an upright pentagram; This being a symbol that Crowley believed was given to him by the “Secret Masters”. (Note that surrounding each of the lower three seals are found the initials of the officer motto given in Hebrew letters and Crowley’s 8=3 motto is utilized on the final seal).